Are you a frazzled entrepreneur juggling work, family and are exhausted keeping it all together? I am here to tell you that you have the power to get over destructive emotions and thinking patterns.. The truth is that you already have the key. Everything you will ever need is inside you. exhausted of keeping it all together? MORE time, mode wide space to just be. Not feeling that life is passing you by anymore. Have "me" time for hobbies and GUILT-FREE pleasures. Shift your life to be as fun as you want. Create a life where you have time and energy. Do the things you truly love. No more sacrificing. Fee that your job and life, is truly enjoyable. Feel a significant increase in downtime. Feeling tired is no longer a factor. your body does the talking. What’s your body telling you? Is this your current situation? Stressed and anxious more often than not. Avoid feeling bored, cause that is when uncomfortable feelings surface. No time for self care. Tired of being sick and tired daily. Emotionally and physically drained by work and life in general. No energy for self care. Not knowing where to start on your to-do list. So used with the aches and pains that you don´t really care anymore. Facing your anxiety won’t cause harm to your body. "I really loved this course and I think I am really starting to connect my mind and my body. I feel great. This course came to me when I needed it most, I truly believe the timing was kind of serendipitous!" "Johanna´s course was great and I am working on all of it. I find if I do mindset the body starts to follow. Thank you for your beautiful course and insights"
And it is so important that you do something about it. Cause unless you don´t, the body and mind will suffer, and with time it will just get worse. You just need to know how to access the true source within yourself. That is why I created a program to help you back to happy. What if you could release emotional issues and stop the aches and pains, release it by knowing how to, and find the true source for your suffering. I happen to believe that there is a physical way to get your stress level down and make the anxiety go away. Thinking that you don´t have time to deal with it all so that you are keeping it bottled up? Many of us do because it is a very normal part of being human. Things are already coming up for you. If not emotionally such as stress, anxiety, it might be physical pains. The body is smart. If you are keeping "stuff" inside you, the body will react to it and try to either push it away or try and hide it. The longer you keep things bottled up, the bigger the chance is that it will become bigger. Feel that you can´t keep up? you are going along your day, but you don´t feel present. You run on habit without really feeling what is really happening. Is negative thinking running your life? will throw you off balance. Over the years I found and practiced Nuad Thai Yoga, mindfulness, meditation, anatomy and dance. Learning about my own body better on a deeper level, understanding the body-mind-connection helped me release and ease emotional and physical problems. Through Nuad Thai Yoga I started feeling where I kept emotions, and when I released the area through massage or self massage, the emotion attachment got released as well. Those destructive thinking patterns that ruins your everyday life just by the way your mind keeps going. I have been in such agony and I know how draining it can be. Feeling that you are a victim of outside circumstances. By becoming AWARE of where I kept tension and destructive emotions in my own body, I was able to release them. And understanding that it has all to do with my inner self. and that any out circumstances was not the true cause to my suffering. I noticed that when I received body work my emotionally well-being started to get better. By that my priories starts to shift. Understand how to let it pass without going in a downward spiral. Seeing things clearer helps you priorities your life better in all parts, including work, relationships and your health and self care. Being on the journey as much as you are. I still have moments when I struggle to keep this going, but the journey is much clearer and with a body-mind awareness I see life clearer even through the fog. 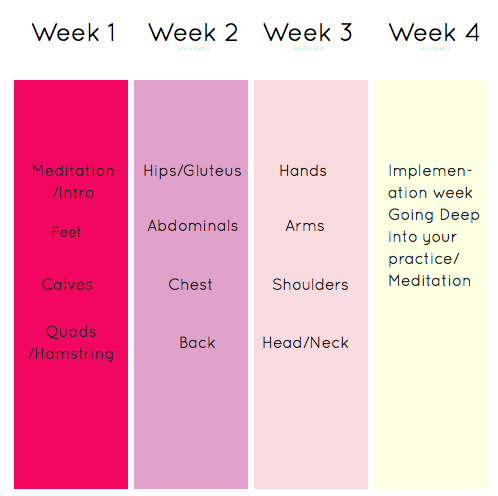 4 weeks of walking through your body on a physical and emotional level. You will go deep into physical and emotional patterns and find where you are keeping tension and destructive emotional patterns such as stress and anxiety. Remember it is all connected. Fun-sheets to support your progress. You will create a road map where you can clearly see problem areas and learn how to release them on your own with easy, effective tools. Daily audio recordings. The recordings will be a support to listen to whenever you need and have the time to, or just need to tune out the surroundings, without having to read the instructions. Just download them and you will have them for life. Exercises, stretches, self massage techniques for you to use to release tension and problem areas that keeps you stuck physically and emotionally. You will find the source to stress, anxiety and physical problems and understand what to do to work it through. That will help you prioritize your work and life where your happiness and self-care is a priority. "I have noticed that I am more aware of my own thoughts and that helps me to take a deep breath to be able to relax and be more present"
"Johanna is great. She makes you feel comfortable from the beginning and is genuinely open to any feedback you might have"
"I felt so safely guided and taken care of, I left feeling renewed and supported, Johanna is the real deal"
I created the Course to help you get the tools I have found so helpful myself to release anxiety and stress in life though self healing. There is no focus on your actual thoughts, which can be so destructive and draining. I will walk you through each part of your body, piece by piece, and through that you will connect with your body, mind and the collation between the two of them. By walking through your own body, in a mindful way you will discover yourself on a deeper level. By doing so, stuff will come up, but don´t be scared, it´s coming up so that it can be released. Who is the Course right for? If you are ready to take charge of your body and mind health. You have been walking around feeling tired and stressed long enough. Wondering why you can´t seem to focus as well anymore and you are just not as happy as you could be. If you have severe injuries or illness that makes it dangerous for you to massage yourself. I would not recommend signing up for this one. I would hate if anyone got hurt from this. Not sure? Talk to your medical doctor first. If you are not interested in a deeper self knowledge and awareness. Not willing to do the work. then I think you should skip this one. As much as I would like to do this for you, it is you who has to do the work. Nobody else can do it for you. You know best what is right for you in this moment. Follow your heart and intuition, that´s what counts. If you are ready for a change, then yey! let´s do this. If you are not ready yet, that´s totally fine. I want you to be ready and in the right place. If you are ready for a change, I think you can take out 15-30 min each day for this. And if not. Wait until you can and do it all in a row. There are no boundaries, I have recommendations but you know what works better for your life then I do. And “I don´t have time” don´t really cut it for me. I believe that if you are interested, you will take the time. If you are reading this and think that you don´t, then it´s ok! I send you love whether you take this program or not. Is there any guarantees that it will work? How can I know this will work? There are no guarantees in life. But I assure you that if you follow the steps and do the best you can, you will get results. Even if you don´t do all the steps, you will get something out of it. You will have the program for life. You can use it again and again, whenever you want to. I am not a massage therapist, I am not used to bodywork, giving or/and receiving, does it matter? Whether you are used to massages, giving or receiving does not matter. You don´t have to have any prior experience. It´s not complicated in a way where you have to know things about the body before hand. If you do, that´s totally fine to. You might recognize things. It´s the layout and the step by step with the integration meditation that is the focus. Trust how things feel and follow your intuition. You will be fine. If you realize that this program is not for you, you can get a full refund 7 days prior to the start date. To get a full refund after the 5th, you have to complete and finish the first two weeks of filled out fun sheets/exercises. After the two weeks are are filled out, send all documents to; info@nuadthaiyoga.com. The exercise has to be filled out completely for a refund. 4 week program where you will get an email each day (Mon-Thurs) with worksheets that you will use. Each day there is one body part in focus and I will tell you how to massage and meditate, and whatever you find, you will get different tools on how to release tension. The last week we are going deep into your individual needs where you will be able to use all the techniques you have gathered through the other weeks. I recommend taking 15-30 min each day for each exercise. If you only have 5 minutes a day, then that`s what you will use. Don´t worry, if you don´t have time to do it once a day, you can do it in anytime you need to. There is no rules in when you do these exercises. I do recommend you give at some time in between each part, so that your mind and body get to relax and regroup in between. Absolutely no anger, guilt or any negative thoughts against yourself. If negative thoughts comes up, or your mind starts to trash itself, send it love and keep working on your path. the voice will quite when it realize you are not feeding it anymore.